When childhood dental care is done right, it sets the stage for a lifetime of healthy smiles. That’s exactly what we strive to do here at ProSmiles Dental & Orthodontics by providing the quality care and friendly atmosphere our young patients deserve. From toddlers to teenagers and everyone in-between, your child will always be welcome at our practice, and we guarantee they’ll walk out with a smile on their face every time. 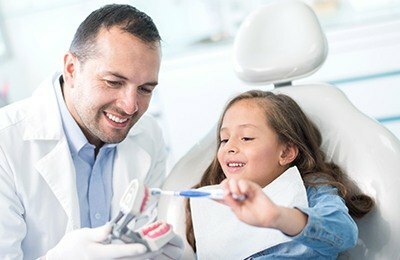 Why Choose Us for Children’s Dentistry? Your child’s routine checkups will be completely tailored to their current age, oral development, and personality so we can take care of their smile and keep them fully relaxed at the same time. 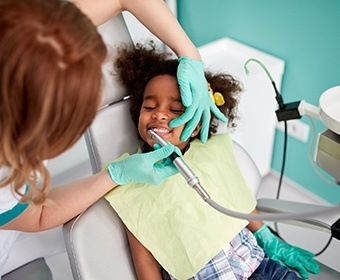 Younger patients will receive a short and gentle exam, and as they grow, your child’s appointments will begin to look more like your own, including professional teeth cleaning. Around the age of 7, we’ll start talking about whether or not they’ll require orthodontic care. Of all the teeth, the back ones are the most likely to develop cavities, especially for children. Why? Because their location and deeply grooved surfaces make them quite tricky for little hands to clean while they are still learning to brush. Fortunately, we can place a protective barrier over these teeth using dental sealants. We’ll simply cover them with a thin, clear layer of composite resin, and it will quickly harden into place, blocking any plaque, bacteria, or food particles from the enamel. Around age 7, we’ll give your child a full orthodontic screening so we can determine if they would benefit from braces either now or in the near future. By addressing any spacing or alignment issues early, they will be much easier to treat, and results will be achieved much faster too. 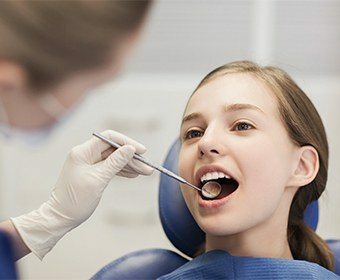 If your child is less than 7 and is already showing signs of crooked teeth or an unbalanced bite, however, we may recommend treatment a little earlier to head off more serious problems. As any parent will tell you, teens are…interesting. Between school, friends, and thinking about college, it’s easy for many to let their oral healthcare go by the wayside. At ProSmiles, we’re ready to help them stay on track with regular checkups and cleanings. Plus, we’ll offer tips they can use at home to make taking care of their teeth between appointments nice and easy. For older teens, we can even help them straighten their teeth with a clear aligner treatment plan like Invisalign or ClearCorrect.